Thoreauback Book Thursday (Vol. 3): On the Duty of Civil Disobedience – It's Lily O. When unrest erupts in society, it is easy to mistake those who are the most outspoken against The Establishment as lawbreakers. Contrarians who will never be satisfied. On the other hand, it is even easier to sympathize with those violated but fail to do anything to help their plight. In that dismissal lies nineteenth century philosopher Henry David Thoreau’s argument in favor of Civil Disobedience. “On the Duty of Civil Disobedience”, originally titled “Resistance to Civil Government”, was published in the Aesthetic Papers in 1849. Written after Thoreau was jailed for his refusal to pay his Poll Tax, Thoreau outlines an argument for Civil Disobedience using Slavery, the Mexican-American War and the treatment of Native Americans as examples. 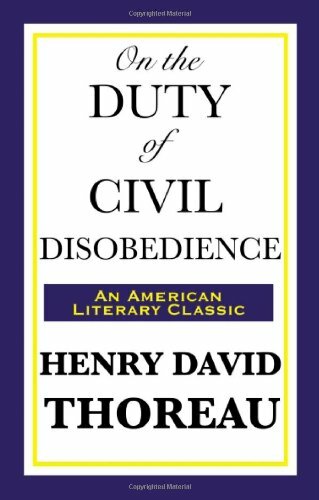 In “On the Duty of Civil Disobedience”, Thoreau makes several stinging critiques. It is simply not enough to vote for a cause to effect change, nor is it enough to simply write about your ideals on the subject. For some causes the only moral option, according to Thoreau, is to go against what the law dictates. Thoreau even goes as far to say that“…a government in which the majority rules in all cases cannot be based on justice “. Instead of adhering to what the majority wants, man should follow what they consider to be moral decisions. An enlightening read, Civil Disobedience poses questions that every citizen should ask of themselves and their country. For me, it made me ponder what societal ill I am supporting with my lack of action. I passively vote in every election, pay taxes and sympathize with the less fortunate. I am able to speak and write about my concerns, but what am I actively doing to ensure that the people I vote for are following through on their promises? Am I only shaking my head in sympathy? Allowing the mournful “um um um” to become a comforting lullaby that allows me to sleep at night? I must do more.